In the last few weeks some less than reputable eBay sellers have been selling counterfeit Australian coins purporting to be genuine year 2000 $1/10c mules. Putting aside the fact that selling counterfeit Australian currency is a federal offense punishable by jail time it’s also a low life act being done simply to profit from the easily deceived. One eBay seller has sold one of these fakes for over $900 already, a hefty sum for something that is worthless and actually a crime to possess. This short article looks at the counterfeit mules and has some key points to look out for so you can easily spot them. Above you can see a comparison of the obverse of a fake mule on the left and a real mule on the right. Each numbered point is discussed below. 1. 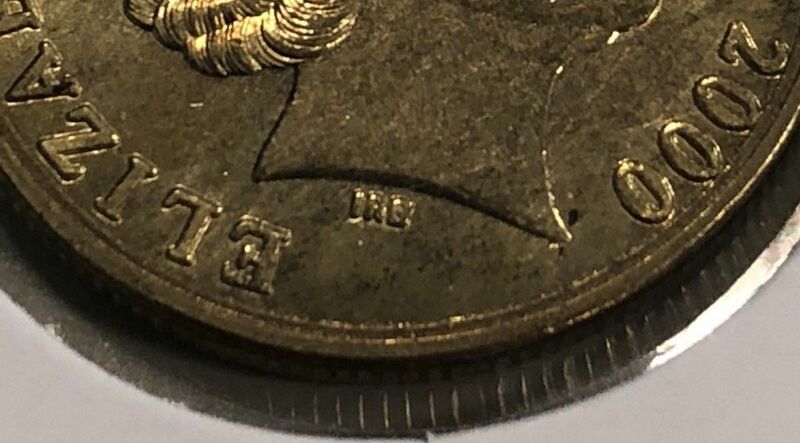 Double rim on the counterfeit coin is far too narrow and too perfectly centered. 2. Legend lettering on the fake coin is too close to the edge of the coin. 3. Hair detail on the fake coin is too coarse and ‘spaghetti’ like compared with the fine detail on the real example. 4. Spacing between the lettering and the double rim is inconsistent on the counterfeit mule while the lettering is the same distance from the double rim around the entire perimeter of the real coin. Above you can see a comparison of the reverse of a fake mule on the left and a real mule on the right. Each numbered point is discussed below. 1. The bodies of the kangaroos on the fake coin are unnaturally rounded and bulbous compared with the much more natural looking contours on the real coin. 2. The faces of the kangaroos are rounded and smooth with deepset eyes on the counterfeit, while the real coin shows much more fine and realistic detail. We thought the kangaroos looked positively ‘zombie like’ on the fake. 3. The second largest kangaroo’s top left ear disappears into the leg of the kangaroo above it on the counterfeit. On the real coin is the ear is above the leg. 4. The end of the left paw of the largest kangaroo is missing from the counterfeit. The counterfeit examples also appear to have reeding around the entire edge of the coin and not interrupted edge reeding like a standard Australian dollar coin should have. See below. The particular seller of these coins is ONLY selling counterfeit coins. None of them are convincing and yet people have still bid them up to 100’s of dollars. If you want to buy a real year 2000 $1/10c coin buy from a reputable dealer or buy one that is graded and encapsulated in a PCGS holder. Remember it is a federal offense to buy and sell counterfeit Australian currency. Images of the counterfeit Australian dollar coin courtesy of the fine people at eBay Australia!